Base class of all sample generators. For each sample in a pixel, a sample generator produces a (hypothetical) point in the infinite dimensional random number cube. A rendering algorithm can then request subsequent 1D or 2D components of this point using the next1D() and next2D() functions. Some implementations make certain guarantees about the stratification of the first n components with respect to the other points that are sampled within a pixel (the low-discrepancy and stratified samplers do this for instance). The general interaction between a sampler and a rendering algorithm is as follows: Before beginning to render a pixel, the rendering algorithm calls generate(). The first pixel sample can now be computed, after which advance() needs to be invoked. This repeats until all pixel samples have been generated. Note that some implementations need to be configured for a certain number of pixel samples, and exceeding these will lead to an exception being thrown. While computing a pixel sample, the rendering algorithm usually requests batches of (pseudo-) random numbers using the next1D(), next2D(), next1DArray() and next2DArray() functions. The difference between calling next1D(), next2D() a number of times versus using the array variants next1DArray() and next2DArray() is that the latter can provide stratification not only with respect to random numbers obtained within another pixel sample, but also within the array itself. This is useful e.g. in the direct illumination strategy, which spawns several rays after hitting a surface when computing a pixel sample. Since this is done over and over again for each one of the pixel samples, it makes sense to stratify over all of the rays that are ultimately generated, and the next1DArray() and next2DArray() methods allow to do this. See the file direct.cpp for an example. Create a clone of this sampler. The clone is allowed to be different to some extent, e.g. a pseudorandom generator should be based on a different random seed compared to the original. All other parameters, are copied exactly. Return total number of samples. Return the current sample index. Same as above, but 1D. Retrieve the next 2D array of values from the current sample. Note that this is different from just calling next2D() repeatedly - this function will generally return a set of 2D vectors, which are not only well-laid out over all samples at the current pixel, but also with respect to each other. Note that this 2D array has to be requested initially using request2DArray() and later, they have to be retrieved in the same same order and size configuration as the requests. 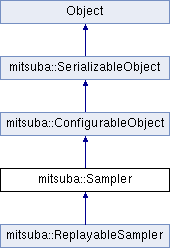 An exception is thrown when a mismatch is detected. This function is useful to support things such as a direct illumination rendering technique with "n" pixel samples and "m" shading samples, while ensuring that the "n*m" sampled positions on an area light source are all well-stratified with respect to each other. Serialize this sampler to a binary data stream. Set the film size in pixels. When this sampler is used to render an image using a SampleIntegrator, the camera implementation will call this method to inform the sampler about the dimensions of the target film in pixels. Some samplers might choose to use this hint to further improve stratification, but this is entirely optional. The default implementation does nothing. blocked Will the rendering be blocked, i.e. parallelized over many rectangular image regions?